I'm no longer surprised with how long JobMob has been around. Frankly, as long as it makes enough to keep paying the hosting bills, it can stay online forever. On the other hand, I'm proud of being able to continue producing a new, high quality (in my eyes 😉 ) article at least once every week the past few years. Most importantly, it's still very fulfilling to help you and other job seekers around the world succeed at something so important in your life. After all, for most people, job search is still harder than it needs to be. And that's before you get anxious about whether your job will be automated (!). Now let's take a look back at some of the most notable things in JobMob-land over the past 12 months. I started JobMob as a way to learn about blogging and job search back in 2006. It was an educational tool. I got hooked, and eventually I learned how to make money from blogging, which lead me to start treating JobMob as a business and a personal branding tool. Since then, JobMob has alternated between being a part-time job and a full-time one for me. I've tried selling my own and others' job search ebooks, courses, other types of products and services, but unfortunately, nothing has worked as well as I hoped. For the first year ever, JobMob is now mainly ad-supported, through Google's AdSense program. As a result, I've been spending less time on JobMob and more time growing an SEO and digital marketing agency under my company Share Select Media. In the meantime, JobMob has become more of a passion project. More than anything, it feels like I'm volunteering for the community, and that's OK. I clearly love doing it (12 years!). In the past few days, I upgraded JobMob to a customized version of the OceanWP WordPress theme. I still like the previous theme (based on Thrive Themes‘ Rise theme) but the company is no longer developing it, and it's not fully compatible with the latest version of WordPress. Plus, I'm always on the lookout for ways to speed up the site, and the new theme is more lightweight, so pages should load a little quicker in your browser. Another change you can see on the site, or just down below, is the new comments system from Thrive Comments. Beyond the usual comments functionality, I have it set up to allow you to vote up the best comments, but it's very powerful and I'll enable some other features soon enough. Still another change, an important one but one you can't see, is that after a decade of hosting JobMob on Amazon's AWS platform, JobMob is now served to you by WPX Hosting. Great service, great customer support, I highly recommend it for any person or company who takes their website or blog seriously. Thank you for 12 terrific years. And thank you to JobMob sponsors for helping make JobMob possible through 12 years and counting. Happy Birthday JobMob. 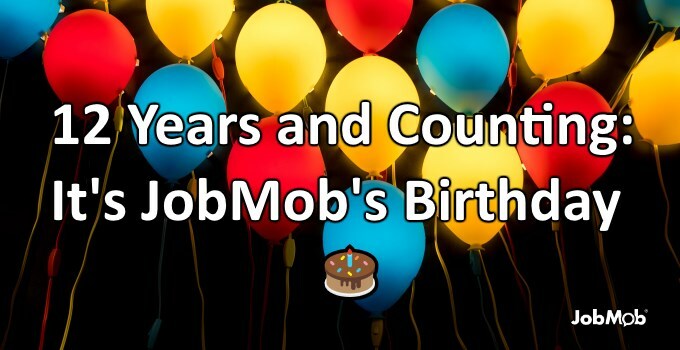 I’ve been a reader for 11 of the last 12 years, Jacob and JobMob was one of my first connections on Twitter. Best of luck in your next 12 years as you continue to transform your business. Thanks for the shout out, Jacob. Keep up the good work.